Cerro Osa’s local staff, Juan and Agustín Mendoza, worked hard in 2009 to improve Friends of the Osa’s native tree nursery. We now have more than 4,000 seedlings of over 40 native species. 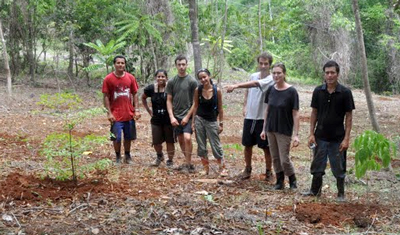 Seeds are collected by hand from the mature forest of the Osa Biodiversity Center. The seeds that are easiest to find often come in a delicious fruit package, making these trees good candidates to stimulate natural forest restoration by attracting seed dispersers such as birds, bats and fruit-eating mammals. 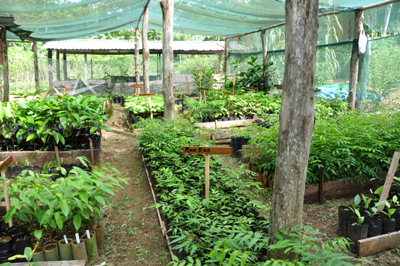 Many of these seedlings will be used in the forest restoration of Cerro Osa’s teak and pochote plantations. In June we partnered with conservation-minded neighbors to plant 60 trees of 13 native species to return part of their property to forest. We also donated 100 trees to La Palma high school as part of a senior project.